Why does your neck hurt? While there are a number of possible reasons, some are far more common than others. We are going to take a look at some of the most common causes of neck pain. Then we will reveal a natural therapy that has been helping patients to overcome this chronic health problem without the use of painkillers. Trauma – Head and neck injuries are among the most common and serious causes of neck pain. However, you don’t have to suffer a serious injury for pain to occur. Any injury that causes an upper cervical misalignment can lead to shifts in the surrounding soft tissue. The body is attempting to keep the head properly balanced, but the results can be stiffness, pinched nerves, and chronic pain. The most serious injuries involve damage to the vertebrae themselves which can potentially damage the spinal cord and cause paralysis. Poor posture – This is very common in the modern world, especially since we are always using technology. This leads people to spend much of their lives looking down, which increases the pressure on the neck. When a person uses proper posture, the spine holds the 12 pounds of the head quite well. But the greater the degree of angle the more pressure the spine has to hold. At a 60-degree angle, the head now exerts 60 pounds of pressure on the neck, and this can lead to misalignments as well as chronic pain. Disc problems – The discs are spongy material that separates the vertebrae so that they do not rub together. Over decades of time, these discs can wear. But we also do many things to cause them to wear prematurely. We already mentioned poor posture and misalignments. When the neck is overused, used improperly, or becomes locked in a stressed position, this can lead to premature deterioration of the discs. A disc may even begin to bulge, resulting in pain and nerve irritation. Smoking is particularly bad for the discs and shrinks the blood vessels that help the discs stay healthy. Osteoarthritis – When cartilage at the joints wears down, arthritis is the result. When this occurs in the joint of the spine, osteoarthritis can lead to chronic neck pain. Spinal stenosis – This refers to a narrowing of the spinal canal. When the passage for the spinal cord is tighter than it should be, pain is just one result. There are a number of factors that can contribute to this condition ranging from spinal misalignments and bone spurs to arthritis and degeneration of the discs. 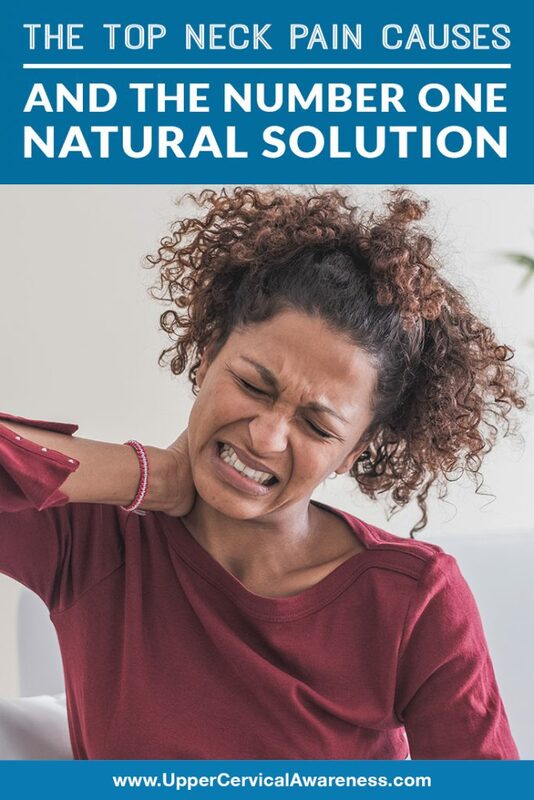 Subluxations – When the vertebrae become misaligned, whether due to trauma or wear and tear, the results may include irritation of the surrounding tissue, pinched nerves, and other anatomical changes that can contribute to pain. Some of these changes take place over the course of months or even years. So by the time you feel neck pain, the underlying cause has been in place for quite some time. If you have never heard of this subspecialty of chiropractic, it may be because there are only about 3,500 practitioners worldwide. What makes upper cervical chiropractic care unique, and why should you consider it if you are suffering from chronic neck pain? Focused – Upper cervical chiropractors are specifically trained to detect and correct misalignments of the C1 and C2 vertebrae. These are the top two bones in the neck, located at the base of the skull. When a misalignment occurs in this location, it can contribute to disc problems, arthritis, spinal stenosis, and it can even make normal posture feel painful. Gentle – Upper cervical chiropractic involves precise measurements taken by means of modern diagnostic imaging techniques such as x-rays and thermography. This allows the practitioner to calculate a very precise adjustment. When you are moving the vertebrae a fraction of a millimeter at a time, there is no intense popping or twisting of the neck. Gentle adjustments last longer and are safe for patients of all ages and health levels. In the rare case that adjusting the neck would not be appropriate due to a structural problem, such as a fracture, this will be revealed in the x-ray before an adjustment is even calculated. As-needed care – Many people worry that once they begin chiropractic care, they have to keep it up every week for the rest of their life. Upper cervical chiropractors perform adjustments on an as-needed basis, so this is not the case. If you find that you are often in alignment when you come for an adjustment, the practitioner will recommend spacing out appointments, perhaps to weeks or even months apart. This will save you time and money. If you are suffering from chronic neck pain, we encourage you to find the upper cervical chiropractor closest to you. The search feature on this website will help you to locate one of our preferred doctors. To learn more, schedule a no-obligation consultation. You may find that this is the natural way to get a handle on your chronic health ailment. Many patients find that other seemingly unrelated health problems also get better once a misalignment is cleared up and the body can heal on its own. Therefore, you may find that you enjoy better overall health and well-being thanks to this precise and gentle form of chiropractic care.